At 7.30 a.m. you are cordially requested to meet your tour manager at Euston Rail station, (see picture of the Burger King restaurant left. Located inside the Rail station main terminal.) Once all on board, our British Coach heads for Dover. Soon P/O Ferry sails across the English channel to France. 90 minutes later, we step-off on French soil at Calais. Another of our trusty coaches is ready to whisk you away to the Belgium's capital. After a scrumptious dinner at Chao Chow City Chinese restaurant, we spend our night in the township of Liege, on the border to Federal German Republic. Good morning this is still Liege (see picture) in Belgium. For those who are lover of crime novels must have heard of the 19th century famous police detective - MAIGRET. Here in Liege, is the city of the police detective MAIGRET, created by GEORGE SIMENON (1903 - 1989), A prolific writer, his enormous literary production has been translated everywhere in the world. It was 1931 Maigret stories were written. Of humble beginnings, George has become one of the most popular novelists of the 20th century. Liege today is a rapidly changing city where old meets new. Tour manager will show you part of it before we leave in the morning. Discovering the typical traffic-free alleys and shopping streets where terraces abound. Visit the central St. Lambert square where a modern Liege is gradually emerging along the majestically flowing Meuse river. And if time permits, and you are not afraid of some physical effort can take a walk up the 406 steps of the MONTAGNE DE BUEREN: the reward will be a fantastic panoramic view over the city of Liege. Continue to Hanover, the bustling city of trade fairs and exhibition, and the financial heartbeat of lower Saxony. We drop off at the central station for your own lunch before we drive through the main thorough fare for a glimpse of this bustling city. 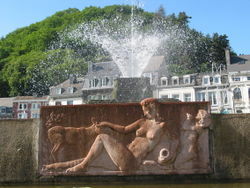 See the old town hall, and the new city hall, before we drop off at the Hanover museum square for a short walk to the Sprengel Museum, and ending up at the tranquillity of the Promenade, popular with young lovers, families and friends enjoy socialising outdoors. This evening, we stop for overnight in the German village - Magdeburg. The German city of Berlin has been its capital during the periods of the kingdom of Prussia, the German Empire; the Weimar Republic as well as during the 2nd World War, it was chosen as the head quarter of the Third Reich. 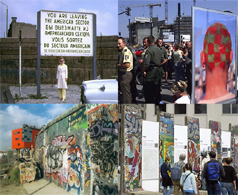 Today, since the unification in 1990, the notorious Berlin Wall took her place in history. We shall now trace her past as we drive towards the boulevards of June 17, the Unter den Linden. Here buildings are revitalized and spruced, showing off her former glories in a grand way. One would enjoy the grander of the monuments such as: Reichstag Bunderstag (Parliament house); Bundes Kanzlefamt and Haus der Kulturen der Welt (Cultural museums); the golden lady statue scintillating in glorious rays on top of the Great star column. At Check Point Charlie, take a picture for keep sake, before we drop of again at the Brandenburg Tor, the Arch de Triumph of Berlin. Continue further, we come to the New "Old" Berlin where Alexandra Platz shows off its slender TV tower, the Bebel Platz, Berliner Dom church, the War Memorial and of course not forgetting the East Side Gallery with its colourful "graffiti" on one section of the Old Wall, destined to perputuality. The rest of the afternoon, in your own leisure. You may wish to ask for drop off at the city's Tiergarten, the largest park in the city for outdoor pursuits, or to the famous DEKAWE, equivalent to the London's Harrods or Selfridges department store, one will be amazed by the merchandise in display. Or revisit Museum Island to check out Pergamon Museum. It houses original-sized, reconstructed monumental buildings such as the Pergamon Altar, the Market Gate of Miletus and the Ishta Gate, all consisting of parts transported from the original excavation sites. The various expositions boast an unrivalled collection of priceless exhibits covering the entire span of human history, from the cradle of civilisation in Mesopotamia through Egypt, Classical Greece and Rome, Byzantium, the Islamic World and the Middle Ages right up to the modern age. The only trouble is whether you could find sufficient time to do all you wish! But alas, the fun of being a tonghang tourists is, that you are given this choice. Evening at a Chinese place and then we check in at our hotel. Spring Colonnade. We shall tour the township, to see a few and of course the most beautiful of all - the 124 columns Mill Colonnade. 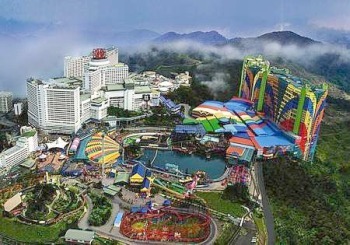 Constructed in the Neo-Renaissance style, it is 132 meters long, stretches over five hot springs. Do not forget your hot water bottle to collect from the Hot Spring Colonande. Here is where you can not only drink the curative waters of the "Hot Spring", temperature 73 degree Fahrenheit, the best-known of the springs and symbol of Karlovy Vary, but also admire the 14-meter high fountain that constantly springs up from the spring itself. Once we have checked in to the hotel, you still have time to change in to your swimming wear, to have a deep detox, cleanse, and relax in the pleasure of the natural sulphur purifying your body. This evening, enjoy a typical Czech dinner at your hotel. A short drive away, is the great capital of the country - Prague. Meet our local expert for a coach orientation, offering a good idea of the topography. See the following sights: the Jewish Quarter (Josefov), Rudolfinum, Municipal House, Powder Tower, Main Train Station, the Opera House, National Museum, Vysehrad Castle, the Dancing House, National Theatre, Vltava River embankments and bridges including Charles Bridge. Later, we stop for our highlight walking trip at the Prague Castle. Admire the the Strahov Monastery and Loreta Church and the Castle ground. Take to the Old Castle Stairs that soon leads to St. Nicholas Church and finally the top of the Old Town Hall Tower. The Old Town Square's most notable sights are the Church of Our Lady before Tyn, the Old Town Hall Tower has the most striking and impressive Astronomical Clock of Time and Death and the stunning St. Nicholas Church. At its vast ground dominated by Jan Hus statue, erected on the 6th July 1915 to mark the 500th anniversary of the death of the reformer. The groundswell of supporters for his beliefs during the 14th and 15th centuries eventually led to the Hussite wars. Here we encourage everyone to sit back, put your feet up simply to soak up the atmosphere over a coffee at one of the many pavement cafes surrounding the square till dinner time. For the shoppers, walk back to Wenceslas Square, where whole street lined with boutique and shops to entice your various funky mood. 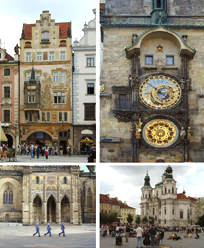 (Pictures shows: Prague- Old town square, the Astronomical clock and the St. Nicholas Church). After breakfast, prepare yourself for a ride through the lovely landscape of the republic. It is the region of charming lowlands and mountain massifs. A wide range of tourist products is prepared to satisfy every visitor of the eastern Bohemia. Beautiful nature and healthy environment of lowlands, foothills as well as mountains is ideal for active tourism. Eastern Bohemia abounds in castles, chateaux, forts and fortifications, town conservation reserves and numerous other attractive sights, built in the styles of Renaissance, Baroque and Art Nouveau. 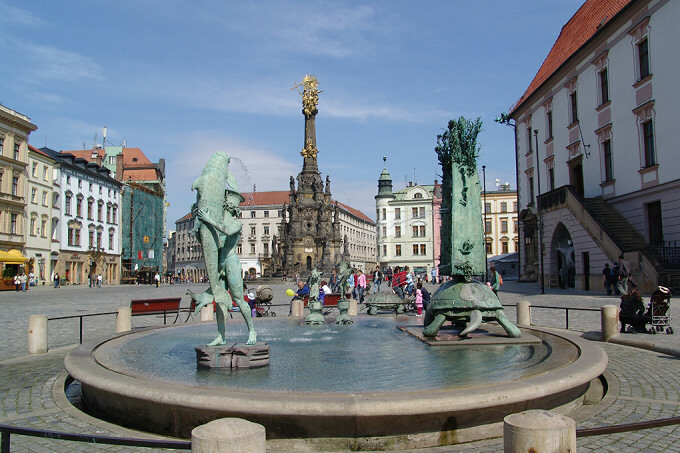 One of which we are stopping this afternoon is the ancient town of Olomouc. This fifth largest town in the country lies in the heart of the so-called Han region. Its history dates back to the 10th century AD when it became an important trade crossing-point. It has the second most significant collection of historical monuments in the country after Prague. The second oldest university in the Czech lands was founded here in 16th century. Stop at the city old square to view - Trinity Column. (see photo), Built in 1716, the first floor and its inner chapel was then completed. In 1854 when it was finally finished, Empress Maria Theresa of Austria and husband Francis 1 of Lorraine, together with Bishop Olomouc consecrated the project. Today the Holy Trinity Column is a monument of world renown and was registered onto the UNESCO list of World Cultural Heritage in the year 2000. There is also the sight of 12th C. St. Wenceslas Cathedral, the high Baroque Hradisko Monastery (open only on Thursdays), apart from feasting your eyes on the gem of Baroque of high prestige, the painting on the ceiling is a joy to see, it is the work of Troger in 1731, with the theme of Christ's Feeding of the 5000. If time permits, we squeeze in one more totally different sights at the eight sided tower, culminating in a gilded onion dome with a cross, of which the Greek Orthodox church of St. Gorazd proudly owns. Prepare your self for one of the most impressive and memorial journey this morning as we drive some half hour to Auschwitz. The World's most notorious place of genocide and mass grave. Started in 1940 as a concentration camp for Polish political prisoners, in 1942 it became the centre for the extermination of European Jews. In 1940 - 1945 the Nazis killed about 1.5 million people there, mainly Jews but also Poles, Gypsies, Russian POWs and people of other nations. The tour begins with a 15-minute documentary film about the liberation of the camp, followed by exhibits in some of the surviving prison blocks, the gas chamber and the crematorium. As you stroll through this historical UNESCO ground, listen to the heart breaking stories and witness the solid evidence of the appalling and atrocious acts of the Nazis. It makes one wonder if there is any streak of humane soul in the aggressors. Ridiculous ! "What? two countries in a one day journey?" you may exclaim! 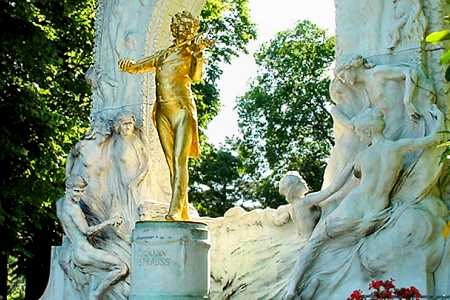 A short drive across the mighty Danube river, we come to the capital of Austria, where the music of Johan Strauss; Schubert; Anton Bruckner; Lehar; to Robert Stolz and Joseph Haydn resonates. 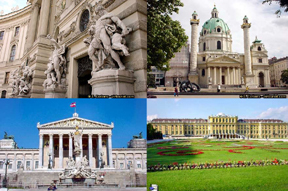 Orientation shows you 17th century Vienna wonderful buildings, churches and palaces: the Hofburgh, former royal court now home to the Vienna Boys' Choir, the Spanish Riding School. One round along the city's Ringstrasse, reveals more of its famous historical buildings and monuments: the State Opera House; the Museum of Fine Arts; the Museum of Natural History, the House of Parliament, the Burgtheater and the City Hall, the University as well as the Votiv Church. After dinner, we check in hotel. "What a remarkable city" You are bound to say as we arrive this morning at Budapest. Our coach drives towards the Gellert hill, situated between Liberty bridge and Elisabeth Bridge, named after Queen Elisabeth (the wife of Francis Joseph ,emperor of Austria), it is also the only suspension bridge in Budapest. Feast your eyes from here where Budapest spreads. Almost all of the capital's famous landmarks are visible. At the top of Gellert hill, visit the famous Statue of Liberty. We will not miss out the Mathias Church, one of the most interesting churches in the country located close to the Royal Palace and the Fisherman's bastion. During the middle ages this area of the castle district was defended by the Fishermen's Guild, and the area was also a site of a medieval fish market. The Bastion with its neo-Romanesque style looks as if it had played an important role during the colorful history of Hungary. Drive pass the Hungarian National Museum; the Central Synagogue built at the end of the 19th cent. in Moorish style; the Heroes' Square, which is the most decorative square of Budapest was constructed for the millenary anniversary of the Hungarian settlement. You can see here the statues of the most outstanding Hungarian kings and politicians. Not far away is the Vajdahunyad Castle, built for the World Exhibition in 1896. It includes all the architectural styles to be found in Hungary. We then visit the largest parks in the City which was the site of the World exhibition 1896. Outside the park area is The Hungarian State Opera House; St. Stephen's Cathedral; The Parliament Building which became a landmark symbol of Budapest. Continue to cross the Margaret Island, situated between the two sides of the capital, some Hungarians consider it to be the 'Central Park' of Budapest. We allow some free time to shop for local souvenirs in the old town before returning to Vienna for dinner. All too soon you might say that the time has come to bid Auf Wiedersehen (Goodbye) to new acquaintance you have turned in to friends as our trusty coach drops you off at the Vienna International Airport. 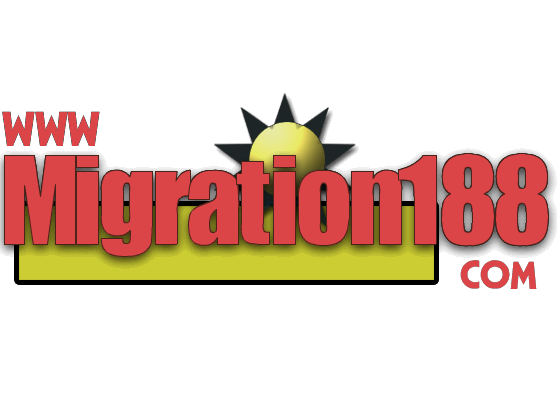 Tickets are your own responsibility for home bound flight. Note: Those who plan to stay extra nights in Vienna can book with us when they registered for this tour. We have special rate for twin or single room at the Vienna group hotel. Please book your own return one way flight before you board our coach. This is on your own account.